I haven't done any Valentines Day nails before and I really want to start using calendar events as inspiration for my nails. So I did a generic heart design but I'm actually quite pleased with the result. 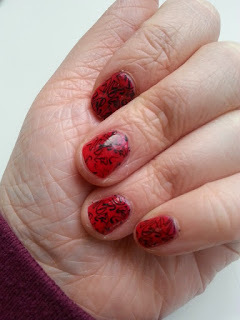 I used Nails Inc.'s St. James for my base and used my Cheeky stamps and Konad's black stamping polish for the design. 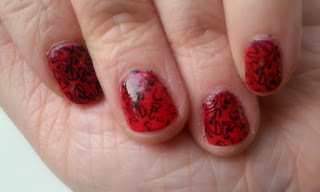 The stamp is a really cool kind of doodle heart design and I thought it'd look great using a black polish. Looking on it, the design is pretty subtle as both of the colours are quite dark but it looks really nice when you can see the actual design. St. James is such a brilliant colour and a joy to apply! You actually only need one coat for it to become opaque but I still applied 2 to make sure. It's a lovely creamy, vibrant red colour and has such good lasting power! For this design I actually struggled a bit with the stamps, I'm not sure if it was because the engraving wasn't deep enough or if I was doing something wrong. Either way I managed to fight my way through the dodgy application and create this design! I used my Essence top coat and the Quick Dry drops to finish. I had to be careful not to smudge the design however! 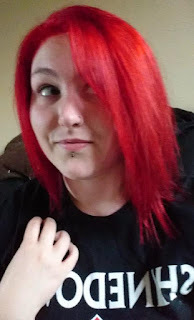 Overall I'm really happy with the design and think it's a great, simple design for Valentines Day.